The Salton Sea Known Geothermal Resource Area (KGRA) has the most geothermal capacity potential in the U.S. Currently home to ten geothermal plants, with -- the most recent addition by EnergySource -- the Salton Sea is a goldmine for geothermal potential. Geothermal energy, the harnessing of heat radiating from the Earth’s crust, is a renewable resource that is capable of cost-effectively generating large amounts of power. In addition, geothermal energy can be relied on to pump out energy 24/7. This reliability makes geothermal viable with invariable fossil fuels like coal, natural gas, and nuclear. It is a no-brainer to tap into the intense geothermal potential offered by the Salton Sea. 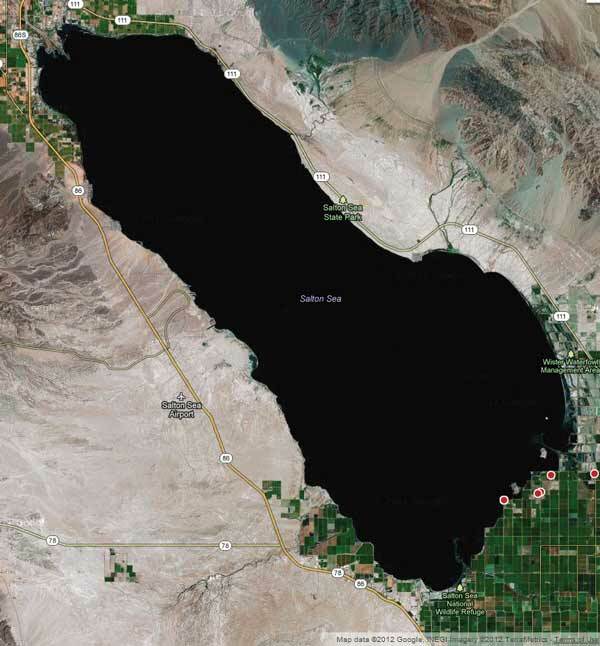 While other proposals to restore the Salton Sea have not taken off due to lack of funds, a proposal by the Imperial Irrigation District (IID) to take advantage of the Salton Sea’s geothermal potential could be the answer to the giant lake’s problems. Global consulting firm Frost & Sullivan released a new analysis this week which forecasts the global installed capacity of renewable energy to more than double by 2025 — increasing from 1,566 GW in 2012 to 3,203 GW in 2025. The authors estimate that global geothermal energy capacity will grow from 11.6 GW in 2012 to 20.7 GW in 2020 and 29.4 GW in 2025. There's hot, there's really hot, and then there's volcanic lava hot. The Earth has plenty of lava bubbling away under its surface, which makes it worth asking if we should try to tap into volcanoes as potential source of limitless, pollution-free energy. Scientists at Seattle-based AltaRock Energy/Davenport Newberry Holdings think so, and they plan to pump millions of gallons of water into the side of the dormant Newberry Volcano about 20 miles south of Bend, Oregon in the hope that it will return to the surface as steam that can be used to drive turbines. In the Newberry project, engineers will pump 800 gallons of water per minute into a 10,600-foot test well (up to a total of 24 million gallons) and scientists will be observing to determine just how much water is needed to make the entire project economically viable. 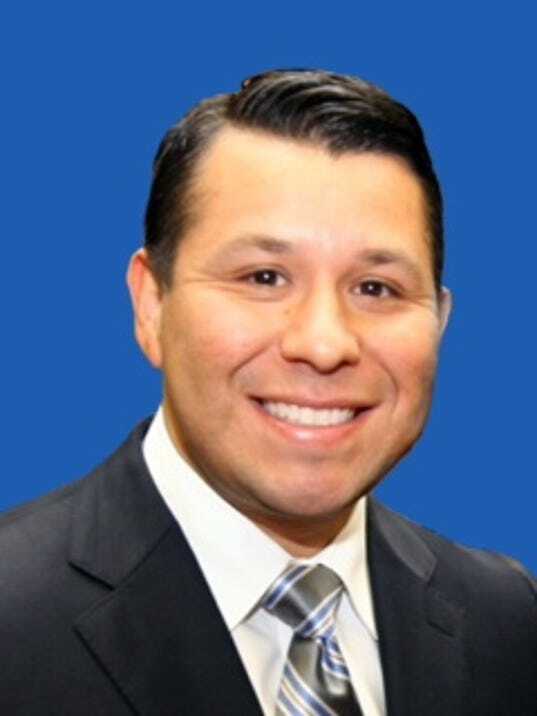 California State Assemblyman Eduardo Garcia has introduced a bill that would require California to get 50 percent of its electricity from renewable sources by 2030, responding to Gov. Jerry Brown’s call for such a mandate in his State of the State address earlier this month. Garcia, a Coachella Democrat, probably won’t be the only legislator to introduce a bill on the topic. But his legislation — Assembly Bill 197, known as the Clean Energy Act — could help set the tone for later debate. Only 2 days left before the early bird registration deadline for the World Geothermal Congress expires on 1 February 2015. If you have not registered for the Congress, do it now whilst the discounted rates are still available! Visit our Program information page for details regarding the comprehensive range of sessions, recognized and eminent speakers and industry specific presentations. Please note that all travellers to Australia, other than those holding New Zealand passports, need to obtain a valid entry visa prior to travel to Australia. For many nationalities (29 in total) an Electronic Visa or Electronic Travel Authority (ETA) can be obtained from your travel agent or airline when making your travel arrangements or directly online through the respective websites. The Congress Organizers can provide you with welcome letters if required by simply emailing wgc2015@arinex.com.au following the completion of Congress registration. Does Hawaii County’s night-time drilling ban apply to Puna Geothermal Venture? That’s a question the County Council will grapple with again next week as the geothermal power plant in Pohoiki starts another around-the-clock drilling project to build a new well. Puna Councilman Greggor Ilagan introduced two resolutions on the issue that he said will be considered Feb. 4. One requests the 38-megawatt plant to comply with the ban, adopted in 2012 following its last drilling project, and drill only between the hours of 7 a.m. and 7 p.m. The other asks the county’s attorneys to take the issue to court so a judge can decide if, in fact, the law applies to the county’s only geothermal power plant. The 47-51 failure of a nonbinding measure calling for a five-year extension of the production tax credit (PTC) delivered a tough start to the year for supporters of the wind energy industry, the credit's primary beneficiary. The credit lapsed at the beginning of the year, and industry supporters hope to see a longer term extension or phaseout of the credit enacted as part of comprehensive tax reform or an "extenders" package, which typically provides a temporary extension for numerous expired credits at once. Cheap oil is not about to kill off wind, solar power and other renewable energies as some experts have claimed, the US government’s chief energy analyst said on Wednesday. The historic drop in crude oil prices, with Brent crude trading at $49.04 a barrel in London on Wednesday, had raised fears that renewable energy sources would struggle to compete. But Adam Sieminski, who heads the Energy Information Administration, said oil was not in head-on competition with renewables when it came to electricity generation – and that government policies would help shield the clean energy industries. The GRC is pleased to announce a mid-year GRC Workshop to Yellowstone National Park. The workshop will include a tour of the major geologic features of the park, the site of the greatest concentration of geothermal features in the world, and discussions of its volcanic history, geochemistry, and hydrology. Only 50 spaces are available. Don't be left out, sign up now! "A Guide to the Energy of the Earth" is an animated TED-Ed video featuring the seven energy literacy principles in action. Use the associated lesson in your classroom or create your own questions for the videos to flip the lesson. The video is applicable to all ages and can be tailored to your lessons on earth's energy systems. Geothermal power plants are a leading provider of permanent, on-site employment in California and the West. As part of its annual industry assessment roll out, the U.S. Geothermal Energy Association (GEA) released preliminary data showing that there were 3,150 permanent, on-site employees at their power plants, or 1.17 permanent jobs per megawatt installed. This is 19 times reported onsite employment of wind projects and 5 times reported onsite employment for solar projects according to GEA. GEA will be releasing employment and other data on the U.S. and global geothermal power industry at its State of the Geothermal Energy Industry Briefing at the Hyatt Regency Capitol Hill in Washington D.C. on Tuesday, February 24. Solar, wind, hydropower, biomass, geothermal and waste-to-energy electricity production could account for 98 percent of Oregon’s and Washington’s electricity needs in just 15 years, according to two new reports. The reports from the Wind Energy Foundation's Renewable America project, which promotes wind development, say developing renewables would create hundreds of thousands of jobs for the region. The analyses, “Powering Up Oregon” and “Powering Up Washington,” put forth two scenarios for alternative energy production. One documents the power production path each state is currently following. The second scenario – under which each state would reach nearly 100 percent renewable energy by 2030. Despite the concern to support growth of wind energy the reports recommend expansion of all renewable energy supplies. For Oregon, the report includes a feature on the geothermal and solar projects at the Klamath Falls campus of the Oregon Institute of Technology. The authors call for up to 155 MW more of geothermal energy production. However, in the Washington report both scenarios estimate an extremely limited deployment of geothermal energy. Yukon MP Ryan Leef, on behalf of Minister Aglukkaq, announced today the Government of Canada is supporting the second phase of a study focused on assessing the potential of geothermal energy development in the Ross River area by the Dena Nezziddi Development Corporation. This investment will assist the Dena Nezziddi Development Corporation to complete a more detailed study of the location and extent of a local geothermal energy source that has the potential to be developed into a commercial scale electricity generation facility. Geothermal development could provide a less expensive local power source for the community by replacing diesel generation, as well as offering potential revenue from providing power to the Yukon energy grid. Geothermal energy developer Calpine today will host a diverse group of female employees in Sacramento to learn more about appointments, personal brand management, and how the legislative process affects their business. The day of meetings will be held in concert with California Women Lead’s annual legislative reception. With 15 geothermal power plants at The Geysers, Calpine is the proud steward of that unique, powerful source of geothermal energy that is, providing roughly 18% of California’s Renewable Portfolio Standard. A quick look inside the Hellisheiði Geothermal Power Station located in Hengill, southwest Iceland which opened in 2006. It is the largest geothermal power station in the world. Production capacity is 303 MW electricity and 133 MW thermal energy. A group of Big Island residents who have pushed for more geothermal development and lower electricity rates is exploring the possibility of converting the island’s electric utility, Hawaii Electric Light Co., into a publicly owned cooperative in light of the pending sale of the utility’s parent company, Hawaiian Electric Co., to Florida-based NextEra Energy. Hawaiian Electric Co. operates the electric utilities on Oahu, the Big Island and in Maui County. NextEra’s purchase of the utilities is expected to close in December, pending regulatory approvals, including that of Hawaii’s Public Utilities Commission. But some Big Island residents are worried that the sale, and HECO’s focus on importing liquefied natural gas in particular, could derail efforts to bring down electricity rates. 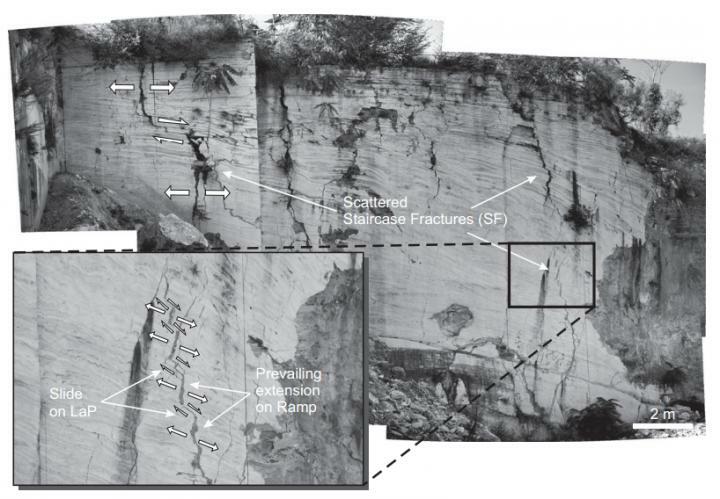 In the new Geological Society of America Bulletin, Matteo Maggi and colleagues from Italy and Brazil present a new model of the development of fractures showing a stairway trajectory, commonly occurring in finely laminated rock, such microbialites and travertines. These fractures strongly enhance permeability by connecting several highly porous zones enveloped in tight impermeable levels. Understanding and predicting this fracture pattern geometry, distribution, and interconnection is valuable not only for locating water supplies, but also for oil, gas, and geothermal exploration. Alternative Earth Resources Inc., headquartered in Vancouver, British Columbia, Canada, today outlined progress in transitioning from geothermal to mineral resource development. The company has cash or cash equivalents of approximately C$2.4M as a result of divesting itself of all of its former geothermal project assets. Alternative Earth currently remains responsible for two geothermal wells at its former New Truckhaven property in California which is optioned to a third party. Well abandonment liabilities are approximately US$200,000; however, these wells are expected to be transferred along the well bonding responsibility to the Optionee, or alternatively, to the underlying geothermal rights owner(s) in the first quarter of 2015. Alternative Earth has previously recovered well bonds from former properties in Oregon and Nevada and would recover a further US$125,000 when the New Truckhaven wells are transferred. As a baseload, renewable power provider, one would think geothermal energy would have quite the pull. Once fully engineered and established, a geothermal power plant can generate reliable power around the clock with minimal costs. It also fills the intermittency gaps other renewables face, such as with wind or solar power. However, no new geothermal power plants were put online in the United States in 2014. And Canada has yet to see any commercial power plants whatsoever, which leads to the question: why isn't geothermal energy gaining more popularity in North America? Despite a lack of new added capacity in the United States this past year, it is worth noting that the US still remains in the top three in terms of countries with installed geothermal power capacity (alongside the Philippines and Indonesia). California provides nearly 80% of the 3,440 megawatts (MW) of US geothermal capacity, and another 16% is found in Nevada. NV Energy has announced that it is seeking proposals to secure an additional 100 megawatts of renewable energy resources for Southern Nevada customers as part of its 2015 Request for Proposals (RFP) for renewable energy resources. The 2015 RFP will be combined with the previously issued 2014 renewable energy RFP for a total of up to 200 megawatts of new renewable energy resources. (AP photo by Jacquelyn Martin). 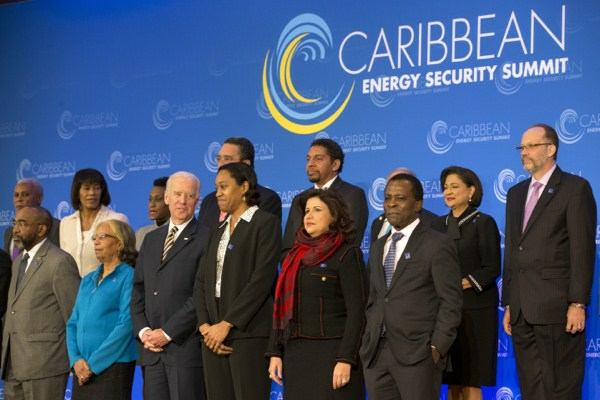 The U.S. Vice President, U.S. Secretary of Energy Moniz, other senior Administration officials, Caribbean Heads of Government, multilateral development banks, and other international partners participated in the Caribbean Energy Security Summit January 26 in Washington, D.C. to work together in support of Caribbean energy security. Included in a Joint Statement is a "commitment to support .....to pursue the following in accordance with national laws: Where technically and commercially feasible, promote and develop affordable: (i) no- or lower carbon electricity generation through wind, solar, geothermal power, hydropower, bioenergy, ocean energy, energy recovery from waste, and other clean energies. On Saturday, the U.S. federal government approved a major renewable energy transmission line that could help open up the West to stranded solar, wind and geothermal energy assets and enable up to 3,000 megawatts of renewable energy — enough to power over one million homes — to feed into the grid. The $2 billion project, overseen by SunZia, will span 515 miles across New Mexico and Arizona, and support more than 6,000 jobs during construction and more than 100 permanent jobs according to the Department of the Interior. The SunZia Southwest Transmission Project, which will tap wind resources in New Mexico and solar and geothermal in New Mexico and Arizona, was proposed in 2009. A program that allows neighbors of Puna Geothermal Venture to sell their homes to Hawaii County is on hold, a move that leaves 30 applications in limbo. The Planning Department, which administers the geothermal relocation program, placed a moratorium on new purchases and auctions of purchased properties in response to uncertainties surrounding the June 27 lava flow, said Joaquin Gamiao, planning administrative officer. The decision was made this month following the purchase of five homes through the program late last year. Those purchases were the first made since the program was flooded with applications in 2012 following renewed controversy regarding geothermal power. While the power plant and its neighbors aren’t directly impacted by lava, the concern is the flow could hamper access to the area and result in the 38 MW plant shutting down if it loses its transmission lines, Gamiao said. Ram Power, Corp. announced today that it has been notified by the Toronto Stock Exchange (TSX) that it is being placed under delisting review in respect of its common shares and common share purchase warrants. The TSX has advised the Company that it is reviewing whether the Company meets the TSX's continued listing criteria in the following areas: (i) the Company's financial condition and operating results; (ii) whether the Company has adequate working capital and an appropriate capital structure; (iii) whether the Company's common shares have an appropriate trading price and minimum public float; and (iv) the fact that the Company has an interim chief executive officer (i.e. its Executive Chairman) and interim chief financial officer. (by Zachary Shahan) One of the greatest privileges of the week was speaking with the President of Iceland, Ólafur Ragnar Grímsson. He has been on the Jury of the Zayed Future Energy Prize for years (since the beginning, actually), and I was able to interview him one-on-one following the Zayed Future Energy Prize press conference. The once-visible drilling equipment is gone, but steps by Klamath Basin Geopower to develop a network of commercial geothermal production wells in the Olene and Poe Valley area are continuing. Honjas said he cannot discuss any aspects of negotiations with possible geothermal energy purchasers. U.S. Geothermal Inc. has provided an update on the results of its three operating projects for the fourth quarter of 2014, and the status of development activities. In light of recently passed federal legislation that extended the qualification for the 30% Investment Tax Credit to projects that began construction prior to December 31, 2014, drilling of the first production well CVP-001 (67-3) was initiated at the Crescent Valley, Nevada project in December of 2014 following completion of gravity surveys, and analysis of prior temperature gradient drilling data. The first string of production casing was set and cemented before year end, and drilling operations on Well 67-3 are continuing. The Crescent Valley properties were acquired in the merger with Earth Power Resources on December 12, 2014. The prestigious Stanford Geothermal Workshop opened this morning at the Frances C. Arrillaga Alumni Center on the Stanford Campus. Roland Horne welcomed the attendees from around the world and gave an overview on the history of the event: "The first Stanford Geothermal Workshop was held in December 1975, as the brainchild of Prof. Paul Kruger one of the three founders of the Stanford Geothermal Program, the other two being Prof. Henry J. Ramey, Jr., and Prof. Lou London. In 1975, geothermal energy development was in its infancy in the US, but expanding rapidly as a response to the 1973 Energy Crisis. The Department of Energy was just being formed, out of the ashes of ERDA, the Energy Research and Development Agency." Jay Nathwani, Acting Director of the Geothermal Technologies Office (GTO) part of the Office of Energy Efficiency and Renewable Energy (EERE) at the U.S. Department of Energy (DOE) then gave an update on the activities of the DOE Geothermal Program. First progress report on AltaRock Energy Inc.'s Newberry volcano project in Oregon, which is the first U.S., commercial-sized enhanced geothermal system (EGS). Some physical mechanisms of injection-triggered seismicity near a fault--like fluid pressurization and stress due to cooling of reservoir rock--have the potential to control earthquakes during injection, a new Stanford study finds. Researchers at the Raft River EGS in Utah have experimented with water temperature, injection rate and wellhead pressure in low-rate thermal fracturing as an alternative to hydraulic fracturing. Greater permeability and water conductivity have improved injectivity rates ten-fold. GRC President Louis E. Capuano, Jr. The Geothermal Resources Council (GRC), is pleased to announce the availability of the 2015 GRC Scholarship Awards. To qualify for one of these awards a student must be a GRC member (student memberships are only $5 per year) as well as a student in an accredited academic institution. Selection of recipients will be based upon a variety of factors, including the individual’s academic record, student activities, geothermal industry experience, and career goals. Two (2) GRC Undergraduate Scholarship Awards of $1,500 – to be eligible for one of these awards, the candidate must be a third or fourth year undergraduate majoring in engineering or geosciences at the time of the award (Fall 2015). 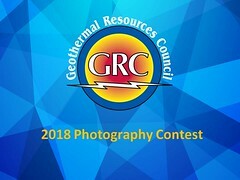 Three (3) GRC Graduate Scholarship Awards of $2,500 – to be eligible for one of these awards, the candidate must be enrolled in a graduate-level program in engineering or geosciences at the time of the award (Fall 2015). Applications must be received by May 4, 2015 to be considered. Successful recipients will be notified by June 2, 2015. The U.S. Geothermal Energy Association (GEA) will be holding a “State of the Geothermal Industry Briefing” on Tuesday, February 24th at the Hyatt Regency Capitol Hill in Washington, DC. This program will provide an update on the U.S. and international geothermal industry featuring release of the 2015 Annual U.S. and Global Geothermal Power Production Report as well as presentations and panel discussion by key leaders in US and international development, finance, technology, policy and regulatory issues. This event will be widely attended by the geothermal industry, congressional staffers, government agencies and the DC community at large. Attendees of the Briefing will receive the first view of GEA's Annual Report which will not be released to the public until the following week. To view the full agenda for the Briefing and to register to attend, please visit: http://www.geo-energy.org/events/2015/Geothermal_Industry_Briefing_2015.aspx. Tests reported at the 2014 AGU Fall Meeting reveal groundwater pockets at high elevations in the remote saddle region between the Mauna Loa and Mauna Kea volcanoes on the island of Hawaii. The groundwater, which could be pumped to the surface to supply much-needed water or developed into a source of geothermal electricity, could help solve the region’s water and energy woes. Not only is the water close to the surface, but its deeper reaches get progressively hotter. Temperatures at depth may exceed 250°C, enough heat to create steam from extracted water. This steam can drive turbines and generate electricity. New measures of resistivity indicated hydrothermal activity at 2-3 kilometers depth, plus evidence of magma storage at around 5 kilometers. In an age of consumption efficiency and fight against climate change, a number of industrial sectors are moving towards hybridization. Even Porsche has released three hybrid models that ensure higher performance levels and care for the environment, reduce consumption and offer new technological possibilities. And although the automotive sector has almost monopolized the technology by producing an increasing number of hybrid vehicles, the energy sector is not lagging too far behind. A few months ago in the town of Castelnuovo Val di Cecina in Tuscany, Enel Green Power (EGP) opened the worksite for the construction of the world's first plant to use biomass to heat geothermal steam, increasing energy efficiency and the electricity output of the geothermal cycle. The existing plant will be supplemented by a small plant powered with locally sourced virgin forest biomass produced within a radius of 70 km of the facility. 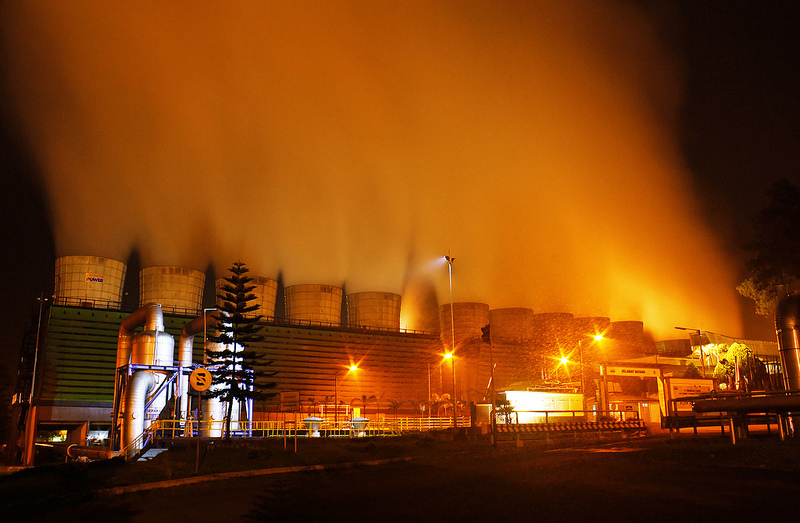 The steam entering the plant will be heated to raise the initial temperature to between 370°-380° from 150°-160°, increasing net power generation capacity, thanks to both the greater enthalpy of the steam and the enhanced efficiency of the cycle due to lower humidity in the generation phase. Euro Disney and the group Pierre et Vacances – Center Parcs, two big actors of international tourism, allied to create a new type of accommodation. Villages Nature, to be built near the Disneyland Paris Park is a cluster of 2,300 housing units based on the quest of harmony between Man and Nature, in accordance with the principles of sustainable development. The most important thing of this project is the geothermal technology which will seduce nature’s fans. Villages Nature designers were inspired by the local geothermal and created a central heating network for the village. The presence of a geothermal water represents the "genius loci" and allows the project to be a sustainable tourist destination. 97% of the site's heating requirement will be supplied by this renewable and sustainable energy. Geothermal energy provides a bathing temperature of 30°C in all season, without emitting greenhouse gases. Deep geothermal energy is thus completely constitutive of the visitor experience at Villages Nature. Cornwall Council in south-west England has published the draft Renewable Energy Supplementary Planning Document (SPD) (PDF) containing guidance on a range of renewable energy technologies including geothermal, inviting comments until Friday March 27. From the section on "Deep Geothermal" in the document, "Water is injected to a depth of approximately 4-5km where it is heated by suitable rocks temperatures exceeding 150˚C. The rock is fractured, allowing the injected water to circulate and heat-up. Water or steam is then recaptured through another borehole and returned to surface to produce renewable heat or drive steam turbines to generate renewable electricity. Cornwall was the location for Europe’s first deep geothermal research and development facility, the Hot Dry Rocks (HDR) project, which took place at Rosemanowes, near Penryn, between 1976 and 1991. It has been estimated that geothermal power in Cornwall could generate up to 4 GW of electricity." A recent report by the Canadian Geothermal Energy Association (CanGEA) says geothermal operations can create more permanent jobs than the Site C dam in northeastern B.C. 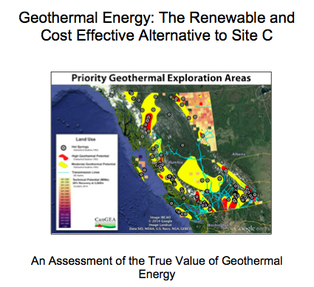 According to Geothermal Energy: The Renewable and Cost Effective Alternative to Site C, 1,100 megawatts – the same amount as Site C – of geothermal power projects would create more sustainable employment for surrounding communities. "While Site C promises only 160 permanent jobs, U.S. Department of Energy statistics indicate that the equivalent amount of geothermal energy would produce 1,870 permanent jobs. This does not include jobs that result from the direct use of geothermal heat, which are also significant." Jay Nathwani, acting director of the U.S. Dept. of Energy's Geothermal Technologies Office, will discuss the DOE's plans to accelerate the development of geothermal energy at the 40th annual Stanford Geothermal Workshop. The event takes place Jan. 26-28 at Stanford University's Arrillaga Alumni Center. 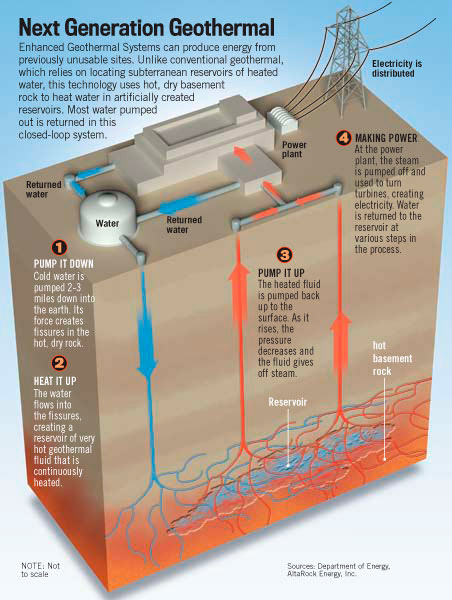 Geothermal energy produces 5% of California's electricity and is used to heat buildings in 43 countries. However, it could become a far larger global resource with the successful development of some technologies, like the application of hydraulic fracturing to get water to hot, dry rock thousands of feet below ground. This three-day workshop will feature research and development results from dozens of universities around the world, U.S. federal research laboratories and private companies. Last year, the staff at Edwards Greenhouse, a Boise institution since 1930, thought of an innovative way to remind customers that while spring and summer are gardening high seasons, the greenhouse is a year-round operation. Taking advantage of its natural geothermal heat and lots of space, Edwards created its first Pop Up Park in 2014. Part of the compound became a public indoor garden complete with a sod lawn, benches, trees, bulbs in bloom, and bright, impressionistic murals painted by staffer LeeAnn Town. Australia's Raya Group Ltd (ex Panax Geothermal) and its Indonesian partner PT Bakrie Power Corp have signed a pact to sell an 85% stake in the 30 MW Sokoria geothermal project in Indonesia to Sydney construction company Space Con Pty Ltd.
Raya said in a press release on Friday that, together with Bakrie Power, it has entered into a heads of agreement on the matter with the Space Con Pty Ltd, which is currently conducting due diligence on the Sokoria project. Once the process is completed, the joint venture partners will sign a final deal with Space Con that would be valued at about USD 3 million (EUR 2.7m). More specifically, Space Con will be required to pay USD 2 million to Raya and Bakrie and also to pour USD 1 million into an account of the Sokoria project company for project development and working capital. The transaction needs to be cleared by Indonesian state-owned utility PT Perusahaan Listrik Negara (PLN), also known as Persero, which will be buying the plants output at USD 0.125 per kWh. The first 5 MW unit of the geothermal power facility, located on Flores Island, is expected to come online in December 2018, where the whole facility is to reach commercial operations between 2023 and 2024. Secretary in the Obama administration. The price of oil has plummeted from more than $100 a barrel in July to less than $50. Meanwhile the U.S. has become the world’s leading producer of natural gas, helping the country become more self-sufficient on energy. Will this abundance of fossil fuels derail the world’s shift to renewable sources of energy, such as wind and solar power? And what does this shifting energy landscape mean for the role of fossil fuels in the U.S. energy mix? And what about nuclear power—should concern of the safety of nuclear waste trump the benefits of exploiting this noncarbon-polluting source of energy? "As renewable energy becomes an increasingly larger fraction of the total energy, the cost of standby electricity and storage becomes part of the cost of renewables. Sometimes the wind does not blow and the sun does not shine." Mexico will launch its geothermal 'Round Zero' in the first quarter to determine which projects will be developed by state utility CFE and which ones will be tendered out to the private sector. 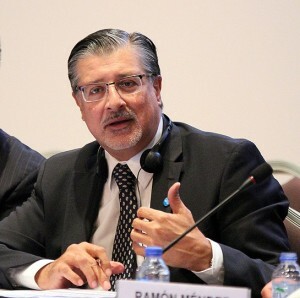 Luis Carlos Gutiérrez Negrín, president of the Mexican geothermal association (AGM), was quoted by local media as saying that the sector will grow 40% by 2020 to surpass 1,400 MW through US$1.6bn in investments. The AGM had previously said that Round Zero would be carried out in January. But although a number of countries are already reaping benefits from investment in renewables, there is concern that many of the countries are yet to exploit those resources. African ministers and delegates at the IRENA Future Energy Summit in Abu Dhabi from January 19-22 noted that a mere handful of countries in the continent are tapping into renewable energy resource. Davis Chirchir, Kenya’s Cabinet Secretary for Energy said that despite the long-term benefits, many of the countries in the region lacked their own initial resources for investment in projects. “While renewable projects are often cheaper, they tend to require up-front capital costs. So for many, we shall require more targeted financing if we are to kick off many from the ground,” said Chirchir. “In Kenya, our investment in geothermal energy displaced some 65 percent of fossil fuels, and brought down the cost to the customer by about 30 percent,” he added. The Kamojang Geothermal Power Plant in West Java. For years observers have decried that Indonesia possesses 40 percent of the world’s potential geothermal reserves but utilizes only 5 percent of that renewable energy potential. With domestic energy demand increasing rapidly and a new reform-oriented administration in power, Indonesia may finally have the pieces coming together to take its rightful place as a geothermal powerhouse. Most estimates put Indonesia’s potential geothermal reserves at 28,000 megawatts. As an energy source geothermal is very clean, emitting a fraction of the carbon produced by fossil fuel driven plants. Geothermal is also a reliable energy source, capable of running 24 hours a day every day with no reliance on volatile markets or unpredictable weather events. While initial costs are high—drilling just one geothermal well can cost $8-9 million and constructing a geothermal plant can take more than five years—variable costs, including maintenance, are very low. Overall the average cost of electricity from a geothermal plant over the course of its lifetime is half of that from a conventional coal plant and 28 percent lower than from a natural gas fired plant. Imperial Valley currently exports over 500 MW of renewable energy to surrounding communities. With the addition of new renewable energy projects that are under development and upon construction would produce up to 2,500 MW of renewable energy. Imperial Valley is poised to be a major contributor in helping California achieve its renewable energy portfolio standards of 33% renewable energy by 2020. 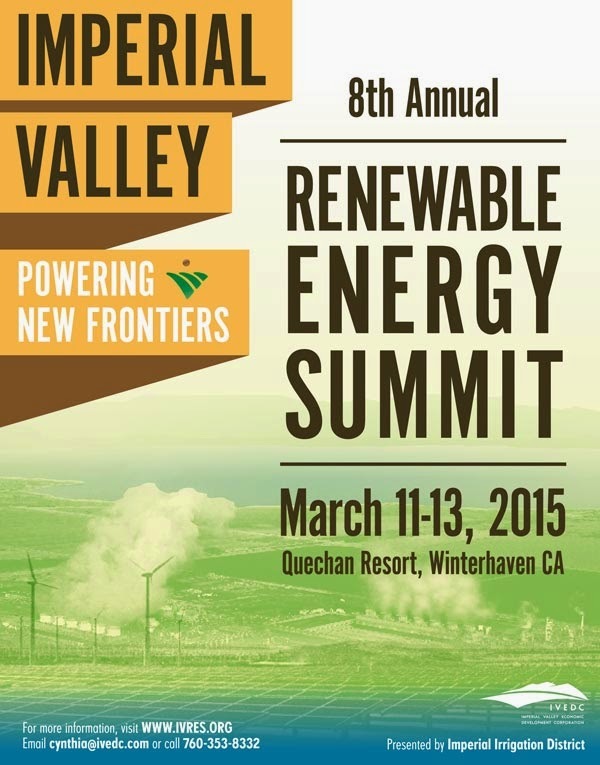 The Imperial Valley Renewable Energy Summit offers an exciting, comprehensive program of engaging and informative speakers to discuss the issues that are most relevant to the renewable energy industry. In addition, the Summit includes: a business exposition, ample networking opportunities, a banquet and a golf tournament. The weather here in northern California has been foggy recently. The visibility can be just a few hundred yards and when it burns off the fog gives way to a lot of low cloud. A high pressure system sits over the west coast and refuses to budge. This affects electricity generation especially wind and solar. When the wind doesn't blow and the sun doesn't shine these renewable energy providers suffer. The California Independent System Operator (CAISO) measures the output from renewable energy providers to the State grid. As you can see in the graph above it never got very windy in California yesterday. There was enough sun to energize solar panels for 10 hours. The weather isn't cooperating. However, geothermal energy was still plugging away, supplying a constant supply of clean, dependable, renewable energy 24/7, 365 days a year. In fact, yesterday in California, geothermal energy was the biggest provider of electricity to the CAISO grid, with almost 26,000 MWh. Solar energy (PV and thermal) peaked at noon and only supplied 16,700 MWh. Wind provided a meagre 4,600 MWh. Yesterday, geothermal energy was the number one renewable energy provider in the Golden State again - and this is not the only day when it supports the economy here in California. China could be nearing publication of a plan to guide the development of geothermal energy resources over the next few years as it plunges ahead with efforts to get more of its energy from renewable sources. The plan will cover the years 2016 to 2020 and could be ready as soon as July, according to Liu Jinxia, head of the geothermal research institute at Sinopec Star Petroleum, which acts as a government think tank and is authorized to research geothermal energy. The National Energy Administration and the Ministry of Land and Resources are currently reviewing the geothermal development plans from dozens of local governments. A detailed plan would map out China’s geothermal resources and outline how companies and governments could commercialize the energy source, Liu said. According to Sinopec Star Petroleum, China has one-sixth of the world’s geothermal resources, but just 28 megawatts of geothermal generating capacity at the end of 2014. The Imperial Irrigation District has for the past year been promoting a plan to develop more geothermal energy plants near the Salton Sea. The Imperial Irrigation District (IID) is pressing for the state to take the lead in settling on a plan for the Salton Sea and paying for it as a deadline nears in less than three years for the lake’s decline to accelerate. IID officials say they never would have approved the 2003 water transfer deal known as the Quantification Settlement Agreement, or QSA, without the state’s commitment to be responsible for much of the costs of “restoration” of the Salton Sea. The deal called for the IID to deliver “mitigation” flows to the Salton Sea for a period of 15 years. After 2017, those deliveries are scheduled to end as increasing amounts of water are sent to urban areas in San Diego County and the Coachella Valley. The Imperial Irrigation District has for the past year been promoting a plan to develop more geothermal energy plants near the Salton Sea. The agency, which owns portions of the lake bed, proposes to generate money through leases and use the funds for dust control projects. 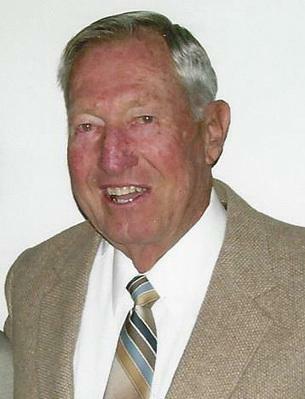 Robert T. Forest of Sparks, Nevada, died of Leukemia on January 14, 2014, surrounded by his family. A funeral service will be held at Ross, Burke & Knobel, 2155 Kietzke Lane, Reno, Nevada on Friday, January 23, 2015 at 2:00 P.M. A short graveside ceremony will immediately follow. Long-time GRC Member Robert Forest has passed away. The last 13 years of Bob's work with Phillips Petroleum Company involved geothermal exploration and development. Some of the important geothermal sites Bob was involved in discovering and developing in Nevada were the Steamboat site in southwest Reno, Desert Peak and Stillwater sites where they're still operating geothermal power plants. Bob retired from Phillips in 1985 after 25 years with the company. Following his retirement from Phillips, Bob went on working as a full-time consultant for Coral Gold Corporation for several years at their Crescent Valley, Nevada gold operation. Following that, he provided consulting services for OESI Power Corporation at Soda Lake and Stillwater in Churchill County and worked on the development of the Rye Patch geothermal field in Pershing County Nevada until 1994. The Indonesian Geothermal Association (INAGA) is proud to present the 2015 Indonesia International Geothermal Convention & Exhibition (IIGCE) to be held at the Balai Sidang Jakarta Convention Center. In Iceland scientists are developing a new way to cut carbon emissions and improve air quality by turning toxic air into solid rock. China Central Television (CCTV)’s Zhang He reported this story from Reykjavik, Iceland. To store carbon dioxide underground, Iceland scientists dissolve CO2 in water, and inject it into reactive volcanic basalt rock. Within a year, over 80 percent of the CO2 will transform into solid carbonate minerals, experts said. The test are being conducted close to Hellisheidi Power Plant, a geothermal power plant in Reykjavik, that offers excellent conditions for the study as it has water, CO2, and basalt rocks. The IRENA report, Renewable Power Generation Costs in 2014, concludes that biomass, hydropower, geothermal and onshore wind are all competitive with or cheaper than coal, oil and gas-fired power stations, even without financial support and despite falling oil prices. Geothermal energy offers some of the cheapest renewable electricity. St. Vincent and the Grenadines has been granted a loan of US$15 million to help fund the development of a 10 to 15 megawatt geothermal project, expected to come on stream by 2018. Prime Minister of St. Vincent and the Grenadines, Ralph Gonsalves said that when the geothermal power plant is complete, it will reverse the ratio of electricity generated by fossil fuel and renewable sources. US$6 million in IRENA/ADFD concessional loans will also go towards a 5 MW geothermal plant in Iran. The 5 megawatts small-scale geothermal project, located in Ardebil, will receive $6m to help provide local heating and power for various agricultural activities benefiting 150,000 people.